For People living with cancer and those who love and care about them. Ask Someone Who Has Been There"
When Lisa Bonchek Adams was diagnosed with breast cancer in 2006 at the age of 37, she decided to start writing a blog about her life as a legacy to leave for her family. Her readership grew quickly, and Lisa discovered she had a remarkable gift for expressing what others could not find the words to say. Lisa fearlessly addressed difficult topics such as what to say to friends and family; how to make good decisions and handle bad news; and, most importantly, how to keep going when things start to seem hopeless. She helped those with cancer feel understood, and those without cancer to understand. When Lisa died in 2015, her readers asked for a book that would bring together her most popular writings in one place. Persevere: A Life With Cancer is the result. Equal parts poetry, journal, and memoir, it is a moving and inspiring portrait of what it means to live with a terminal illness, and a guide for patients, families, friends, and caregivers. It was Lisa’s wish that all of the proceeds from the sale of this book be dedicated to researching a cure for metastatic breast cancer. In that spirit, we’ve established the Bonchek Family Foundation in her honor. Profits from the book in addition to tax deductible donations help the Foundation to continue Lisa’s work "to teach, to enlighten, to share, to support, to fundraise for research... and to always honor those who have died." The book is an edited collection of writings by Lisa Bonchek Adams. Lisa died in 2015 from breast cancer at the age of 45. She was a devoted wife and mother. She was also a remarkably prolific and talented writer. Lisa had a gift for conveying the experience of cancer in a way that helped those with cancer feel understood, and those without cancer to understand. She simplified the complexities of treatment in a way that educated and informed. Through her, the uncomfortable and painful became approachable and accessible, without minimization or denial. As her mother and brother, we are regularly approached by people who followed Lisa’s writings. They tell us how much her writings meant to them, either as patients themselves or in helping them support others. They were hopeful Lisa would publish her work to make it easier to reference and to share. Unfortunately, Lisa did not have enough time to publish her writings in print. To carry on Lisa’s mission, we have curated Lisa’s blog posts into this collection. We have selected the writings that best capture her voice, spirit, experience, and wisdom. They are arranged in a way we believe will tell her story and enable you to know her in the way that others did when she was alive. Lisa’s writings are truly timeless. We believe they will be as valuable today as when Lisa first wrote them. Be forewarned that some of the writings are not easy. But neither is cancer. “A fantastic book for anyone suffering from cancer, any cancer survivor, or anyone who loves someone with cancer. There is much good advice--what to say and what not to say when someone has cancer. Lisa helped me understand the suffering of cancer patients where the treatment is almost as toxic as the disease itself. 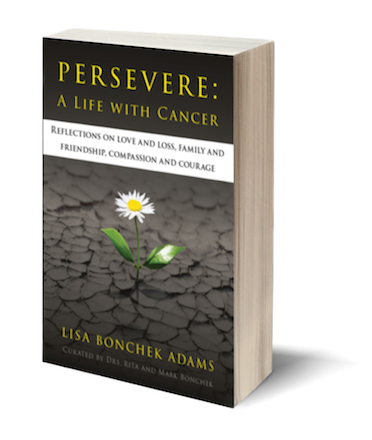 “Lisa Bonchek Adams is one of the magnificent few leaving behind a truly beautiful, insightful and extremely readable account of her life and death with cancer. It is not a book to ignore—for all people—because she deals with the bittersweetness of our limited lives, fear of the unknown death and great joy in simple pleasures. Lisa's book made a huge difference in my life, struggling with how to have a meaningful, rewarding time with a family member recently diagnosed with her cancer retuning, now metastasized stage 4. Thanks to Lisa’s refreshing, even humorous, insights into thoughts, hopes and fears, the time with my loved one was incredible . I learned to listen, to hear, to emphasize and to sympathize, rather than ignore what needed to be communicated. With Lisa's book our movements together were precious. My eyes were open, I was enabled to connect in a meaningful way, to help. My heart is glowing, peace is within. Please let us know if you are purchasing on behalf of commercial organizations, resellers/wholesalers, or a nonprofit/NGO.